The Bengali new year is upon us. Tomorrow, 14 April, we bring in the year 1423, with brand new clothes, authentic Bengali cuisine, and desserts galore. 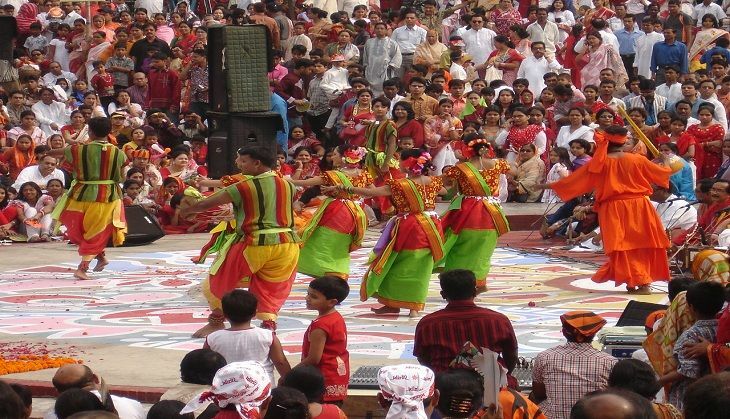 Nobo Borsho marks the first day of the month of Boishakh - the first month of the Bengali calendar. The Bengali calendar, interestingly enough, was first promulgated by Mughal emperor Akbar. Even though the new calendar came into force in the twenty-ninth year of Akbar's reign, it dates from his ascension to the throne on 5 November, 1556. The Mughal Emperor fused the Hindu and Islamic dating systems to create a new calendar, bearing in mind the facilitation of revenue collection. And of course, to glorify his ascension to the throne. Titled the Tarikh-e-Ilahi, calendar of God, the Bengali calendar was introduced in the year 1584 AD, with the beginning of the year coinciding with harvest season. Before the Tarikh-e-Ilahi came into force, the Mughal emperors had been using the Hijri calendar for revenue collection. However, as Abul Fazl explains in Akbar Namah, the use of the Hijri calendar was irksome to the peasantry because there was a difference of 11 or 12 days between the lunar and the solar years, with 31 lunar years being equal to 30 solar years. Revenue was collected according to the lunar year, whereas the harvest was dependent on the solar one. From the beginning of his reign, Akbar had felt the need of introducing a uniform, scientific, and workable system of calculating days and months through a reformed calendar. And thus, came about the Tarikh-e-Ilahi , a calendar that is still followed by millions in the Bengali community. It is of paramount significance to businessmen in the region as well, with Haalkhata marking the beginning of accounting for the upcoming year. However, much like the Din-e-Ilahi, the Tarikh-e-Ilahi really didn't last for long, beyond Akbar's reign. Only in West Bengal, and in Bangladesh, did this dating system stick, and become integral to it's religion and agriculture. Here's wishing you Shubho Nobo Borsho, with Probhat Pheris, sumptuous feasts and lots of song and dance!